Dodge shows no signs of slowing down in the competitive heavy-duty truck sector. For 2010, they have thrown down their hand with a slew of upgrades, including an available Crew Cab and a refined exterior. The restyled interior has features like more storage locations, six ring instruments and high interior volume with the Mega Cab that were introduced in the 2009 1500 series. Historically, this sector has always been about functionality and towing capacity, but heavy truck buyers expect more these days and Dodge has plans to continue expanding its market share. Since the Dodge Ram’s introduction in 2004, styling has always been bold, but this year’s upgrade has seen the iconic front of the “power bulgeâ€ nose grow even taller. Not an easy feat in the face of ever-steeper CAFE standards that demand slicker profiles to meet rising mpg mandates. With the available 6.7-liter Cummins Turbo Diesel pumping out 650 lb-ft of torque at 1500 rpm, there is very little the Ram can’t pull or haul. 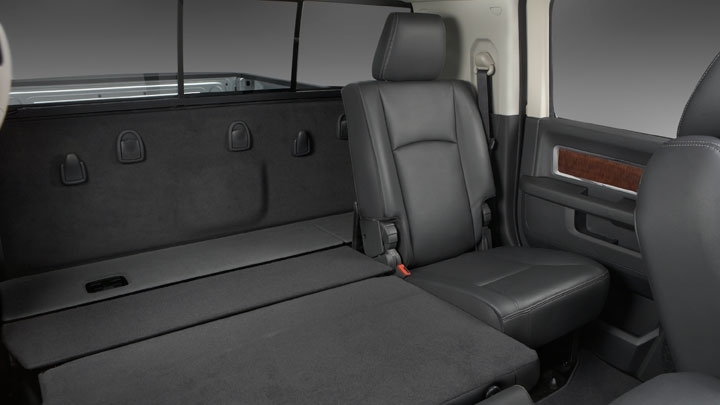 The available Mega Cab with fold-flat rear seats make for cab that is 9 inches longer and almost a full sleeper. Also, the segment-exclusive diesel exhaust brake gives a whole new level of control when towing. The new dually bedsides are aerodynamic and now full stampings instead of flimsy plastic. Without a load, the six-speed automatic seems to have a hard time sticking to a gear on mild grades. 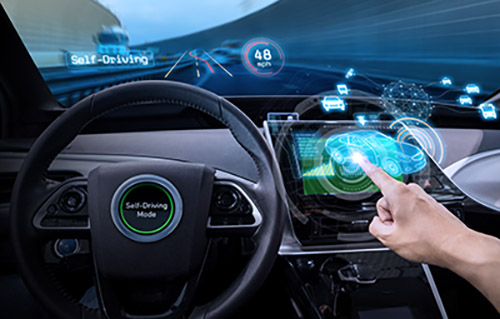 Call us picky, but the controls for the cruise control are annoyingly close to the steering wheel and could have been located somewhere else. The additional convex mirror on the outside of the flat mirror is confusing on a quick glance. Just climbing into one of these babies, you know you’re dealing with a serious piece of equipment. It feels like a truck from the moment you turn the key. On the road, the reworked suspension does a good job with handling surface imperfections, but when the pavement gets rough, even with the fluid filled, hydro-mounted cab, you feel a slapping sensation from back to front down the frame rails. To be fair, every vehicle with an extra-long wheelbase and heavy-duty suspension suffers this phenomenon and the Ram is not the worst of bunch. We love the new diesel exhaust brake, which works exactly as promised, and is just plain cool. We were hoping for the same type of rumble you get from a loaded 18-wheeler, but the Cummins was a few cylinders short. All in all, the Ram inspires confidence and performs its duties with a high level of comfort and a pleasantly quiet cab. Dodge offers only two engine choices in its heavy-duty lineup, but considering the specific use of the range, two engines are more than sufficient. The standard 5.7-liter HEMI V-8 with variable valve timing for greater efficiency and performance pushes 383 horsepower and 400 lb-ft of torque. It also has an active intake manifold to vary the runner length for more horsepower or torque as needed. The only transmission offered with the HEMI is a five-speed automatic. The optional 6.7-liter Cummins Turbo Diesel delivers 350 horsepower, but kicks out a Queen Mary-dragging 650 lb-ft of torque. This advanced diesel is equipped with a diesel particulate filter for cleaner emissions and can be mated to a six-speed manual or six-speed automatic. The power wagon handled the off-road tasks in stride with impressive articulation, and with the locking differentials, proved formidable even on slippery, off-camber grades. The engine brake is a great option that makes you wonder what you’ve done without it for so many years. It’s so intuitive and it can make you forget that you have a gooseneck full of pipe fittings behind you. The trailer brake mechanism is a nice feature, providing displays in the gauge cluster and under the dash. Out back, every Ram Heavy Duty comes with a standard class-4 receiver and a dual 4pin/7pin trailer light socket for compatibility in any situation. The hood, grille and bumpers are unique to the Heavy Duty, and the Power Wagon comes with locking differentials, electronic disconnecting sway bar and Warn 12000-lb winch built into the front bumper. 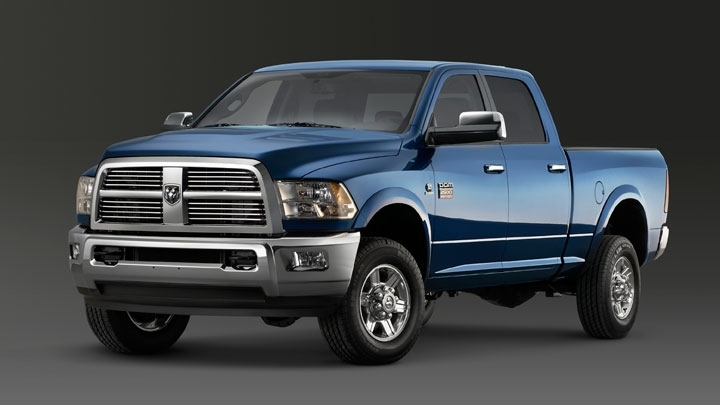 The 2010 Ram Heavy Duty comes with the EVIC command center giving direct monitor of transmission, oil, temperature, trailer brake gain and fuel/trip functions. The memory system for seats and mirrors is an option on all but the base model, as is a 115-volt, 2-pin, dash-mounted power outlet. A navigation system, reverse parking sensors and just about any major feature found on the light duty trucks is offered on the heavy-duty lineup, including the Alpine stereo upgrade and iPod jack in the glove box. The Ram’s mileage is fairly respectable for a truck of its size and capabilities. The HEMI-powered 2500 delivers 15 mpg highway and 20 mpg city. Numbers for the Cummins Diesel were unavailable at time of writing. Inside, the upper trim levels rival what you would find in any well equipped light truck. 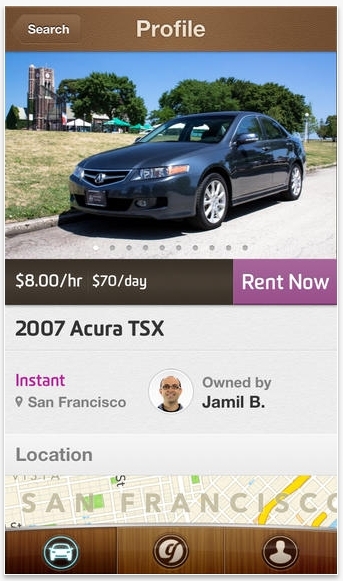 Posh leather seats, wood grain and automatic climate control are all standard or available through packages. We liked the addition of more convenient storage places in the dash and center console and the addition of the topstitching to the dash. These small details go a long way to make the cabin space more functional. The new grille is one and a half inches taller than the outgoing model’s, which not only looks macho, but also allows for a larger radiator to aid in cooling the engine when towing. The chrome front bumper is retooled and much larger for a bolder look. The louvers in the hood and smoothed front end allow for a slicker profile without compromising brand identity. The graphics on the Power Wagon are attractive as well. The base Ram 2500 is priced $1970 less than last year’s model and the Mega Cabs will all be priced less than last year’s as well. Base price for the 2500 4x2 regular cab is $28,165 and $31,140 for the 4x4. 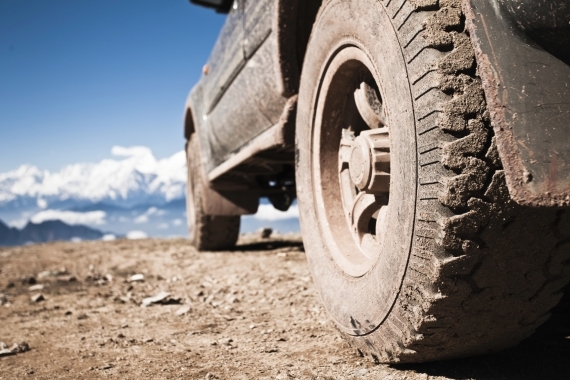 Crew Cabs start at $31,415 and $34,810 for the two-wheel and four-wheel drive models, respectively. It’s a few thousand more than a Ford Super Duty, but you get some nicer finishes. 3500s go for $35,630 with 2WD and $38,545 with 4WD. Add a Crew Cab and tack on an extra $3570. 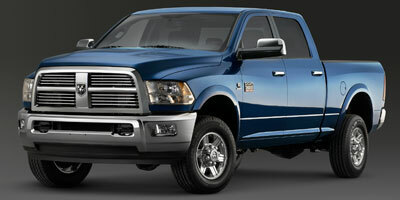 Dodge has done a respectable job of keeping up with this competitive market sector. Making a utility-based truck with the manners of a sedan may not be an achievable goal, but it hasn’t stopped them from trying. With refinements to the exterior as well as creature comforts, Dodge hasn’t given loyalists any reason to stray this year. 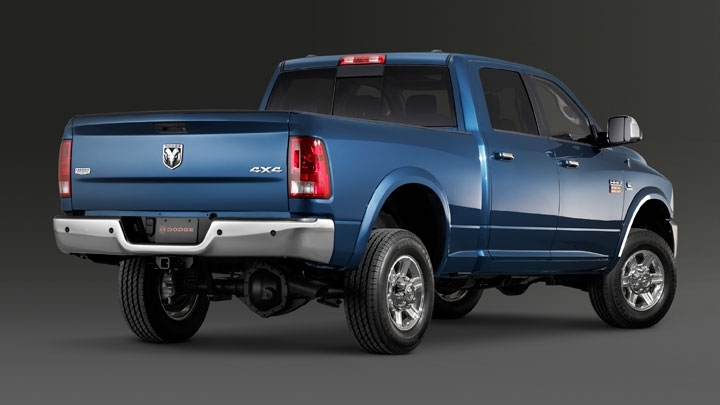 It’s our guess that in 2010 the Ram Heavy Duty series will continue to gain market share as it has for the last five years.